Recommended only for die-hard fans of the recently released movie, Titan Books’ World War Z: The Art of the Film is more of a paperback companion piece than its own beast. At 160 pages, it’s filled with concept paintings, storyboards, publicity photos, and behind-the-scenes snapshots. Accompanying those images is the full screenplay written by Matthew Michael Carnahan (Lions for Lambs), Damon Lindelof (Cowboys & Aliens), and Drew Goddard (TV’s Lost). Scattered throughout its pages are quotes from the cast and crew. 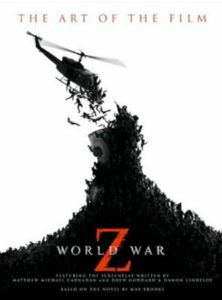 One quote toward the beginning from director Marc Forster (The Kite Runner) remarks, “Zombies are an interesting metaphor… the dark side of our own humanity.” Such one-note insights about the subject of World War Z remain consistent throughout the other quotes from the cast and crew, containing little substance beyond publicity blurbs. In turn, the quotes are a good metaphor for this book. It’s as though the makers of the book are trying to sell us the movie, but only devotees of the movie would ever buy this book. The inescapable result: disappointment. It should be noted that there’s no author listed for this title. Aside from the screenplay, there’s only a small section with three short paragraphs by the movie’s “weapons master” about shooting with greenscreens. What we take away from World War Z: The Art of the Film must be found between the lines, where there’s an obvious disconnect between the screenplay, the concept designs, and the finished film. Having received this review copy of the book the same day I saw the movie, it was interesting to read portions of the script and compare them to what I had seen. Almost every sequence in the script seems off when placed against the corresponding sequence from the movie. Forster, along with his editors Roger Barton and Matt Chesse, must have done a real hand-and-slash job on the final product—beyond even what was evident onscreen. Either that, or the screenplay in the book isn’t the final shooting script, not exactly. Whatever the reason for the script and movie being different, the portions of the script that were missing from the theatrical cut would have added some much-needed depth and character. Reading the screenplay, one can see that Mireille Enos’ role, Karin, the wife of Brad Pitt’s Gerry Lane, was particularly reduced. Likewise, some of the images contained within the book suggest another vision for the movie earlier in production. Many photographs from the movie are placed next the concept art for the given scene, and they match up nicely. But toward the back of the book, a section of zombie artwork suggests a gristlier vision than what made it to the screen. Decaying skin, limbs torn away, and bloody attacks are on display in these pages—most absent from the theatrical cut because the producers wanted to gather larger crowds with a PG-13 rating. Had the filmmakers followed these designs, surely the end result would have been an R-rating. Instead, the completed movie depicts bloodless zombies inside blurry CGI hordes via wobbly camerawork. As a companion piece, World War Z: The Art of the Film helps to detail the disconnect between the writers, the concept artists, and director Marc Forster. For such a mega-budgeted Hollywood product to have so little cohesion or uniformity in its production is surprising—sort of—and ultimately a letdown onscreen. There were some great ideas in the screenplay and concept art, as shown in the book, but many of them didn’t make it into the movie. If you’re unlike me and forgave the inconsistencies in World War Z to just enjoy the basic thrills, or if you want to further investigate what happened from page to screen, World War Z: The Art of the Film should supply you with a modest study.